Does it feel boiling hot to you today or is it just me? And how we can tell? If I say today's hotter than yesterday and you disagree, how can we settle the argument? One easy way is to measure the temperature with a thermometer on both days and compare the readings. Thermometers are simple scientific instruments based on the idea that metals change their behavior in a very precise way as they get hotter (gain more heat energy). Let's take a closer look at how these handy gadgets work. Photo: Now that's what I call cold! This dial (pointer) thermometer shows the temperature inside my food freezer:around −30°C (inner scale) or −25°F (outer scale). It's exactly the same temperature, but measured in two slightly different ways. Photo: This thermometer contains a red, alcohol-based liquid and is marked with both a Celsius scale (left) and a Fahrenheit scale (right). The current temperature is about 22°C or aout 72°F. The Fahenheit scale is named for German physicist Daniel Fahrenheit (1686–1736), who made the first mercury thermometer in the early 18th century. The Celsius scale is named for the Swedish scientist who devised it, Anders Celsius (1701–1744). 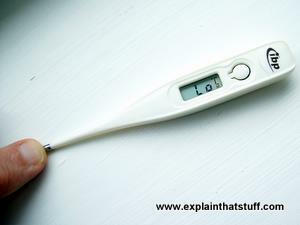 The simplest thermometers really are simple! They're just very thin glass tubes filled with a small amount of silvery liquid (typically mercury—a rather special metal that's a liquid at ordinary, everyday temperatures). When mercury gets hotter, it expands (increases in size) by an amount that's directly related to the temperature. So if the temperature increases by 20 degrees, the mercury expands and moves up the scale by twice as much as if the temperature increase is only 10 degrees. All we have to do is mark a scale on the glass and we can easily figure out the temperature. How do we figure out the scale? Making a Celsius (centigrade) thermometer is easy, because it's based on the temperatures of ice and boiling water. These are called the two fixed points. 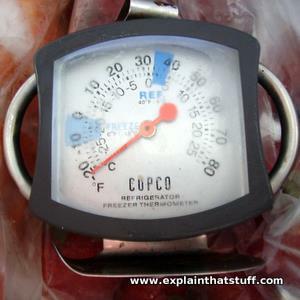 We know ice has a temperature close to 0°C while water boils at 100°C. If we dip our thermometer in some ice, we can observe where the mercury level comes to and mark the lowest point on our scale, which will be roughly 0°C. Similarly, if we dip the thermometer in boiling water, we can wait for the mercury to rise up and then make a mark equivalent to 100°C. All we have to do then is divide the scale between these two fixed points into 100 equal steps ("centi-grade" means 100 divisions) and, hey presto, we have a working thermometer! Not all liquid thermometers use mercury. If the line you see in your thermometer is red instead of silver, like the one in the picture here, your thermometer is filled with an alcohol-based liquid (such as ethanol). Not all thermometers work this way, however. The one shown in our top photo has a metal pointer that moves up and down a circular scale. Open up one of these thermometers and you'll see the pointer is mounted on coiled piece of metal called a bimetallic strip that's designed to expand and bend as it gets hotter (see our article on thermostats to find out how it works). The hotter the temperature, the more the bimetallic strip expands, and the more it pushes the pointer up the scale. 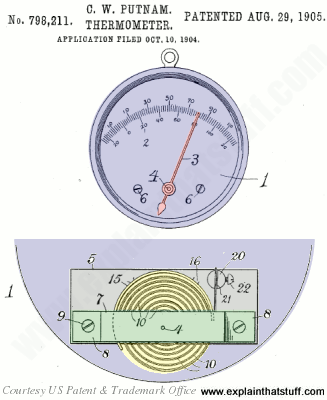 Artwork: How a dial thermometer works: This is the mechanism that powers a typical dial thermometer, illustrated in a patent by Charles W. Putnam from 1905. At the top, we have the usual pointer and dial arrangement. The bottom artwork shows what's happening round the back. A bimetallic strip (yellow) is tightly coiled and attached both to the frame of the thermometer and the pointer. It's made up of two different metals bonded together, which expand by different amounts as they heat up. As the temperature changes, the bimetallic strip curves more or less tightly (contracts or expands) and the pointer, attached to it, moves up or down the scale. Artwork from US Patent 798,211: Thermometer courtesy of US Patent and Trademark Office. Photo: Here's the coiled bimetallic strip from an actual dial thermometer (the freezer thermometer in our top photo). It's easy to see how it works: if you turn the pointer with your hand toward colder temperatures, the coiled strip tightens up; turn the pointer the other way and the strip loosens. 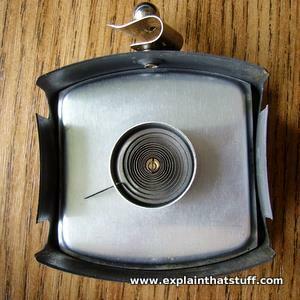 One problem with mercury and dial thermometers is that they take a while to react to temperature changes. Electronic thermometers don't have that problem: you simply touch the thermometer probe onto the object whose temperature you want to measure and the digital display gives you an instant temperature reading. An electronic thermometer works by putting a voltage across its metal probe and measuring how much current flows through it. If you put the probe in boiling water, the water's heat makes electricity flow through the probe less easily so the resistance goes up by a precisely measurable amount. A microchip inside the thermometer measures the resistance and converts it into a measurement of temperature. The main advantage of thermometers like this is that they can give an instant reading in any temperature scale you like—Celsius, Fahrenheit, or whatever it happens to be. But one of their disadvantages is that they measure the temperature from moment to moment, so the numbers they show can fluctuate quite dramatically, sometimes making it difficult to take an accurate reading. Photo: 1) Electronic medical thermometer from 2010. You put the metal probe in your mouth, or somewhere else on your body, and read the temperature off the LCD display. Photo: 2) Electrical resistance thermometer from 1912: Precise electrical thermometers, known as resistance thermometers, use four resistors arranged in a diamond-shaped circuit called a Wheatstone bridge. If three of the resistors have known values, the resistance of the fourth is easy to calculate. If the fourth resistor is designed in the shape of a temperature probe, a circuit like this can be used as a very precise thermometer: calculating its resistance (from its voltage and current) allows us to calculate its temperature. 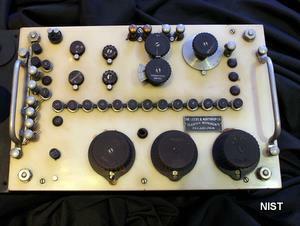 This example of a bridge-type resistance thermometer was built by Leeds and Northrup and used for temperature measurements at the US National Bureau of Standards (now NIST) in the early 20th century. Despite its chunky and clumsy appearance, it's accurate to within 0.0001 degrees. Photo courtesy of National Institute of Standards and Technology Digital Collections, Gaithersburg, MD 20899. If you want to measure something that's too hot or cold for a conventional thermometer to handle, you'll need a thermocouple: a cunning device that measures temperature by measuring electricity. And if you can't get close enough to use even a thermocouple, you could try using a pyrometer, a kind of thermometer that deduces the temperature of an object from the electromagnetic radiation it gives off. What is a temperature scale? Photo: Temperature scales are linear: a certain rise in temperature always moves you the same distance up the scale. That doesn't mean thermometers have to be made in straight lines, like rulers: it means each division of the temperature scale occupies exactly the same amount of space (or, if you prefer, the mercury, pointer, or other temperature indicator has to move just as far to indicate each new division as the temperature rises or falls). This dial thermometer from a gas boiler shows you the temperature of your central heating in Celsius using a circular (but still linear) scale. A thermometer doesn't necessarily need a scale or numbers marked on it. Just imagine if you were on a desert island and you came across an old thermometer in the sand with the scale and the numbers rubbed away, but otherwise working perfectly okay. 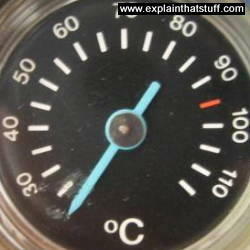 You could still use this it get an idea of temperatures. You could use it very roughly to say things like: "The mercury level is about halfway up, which is higher than it was yesterday, so it must be hotter today." A better method would be to put your own scale on the thermometer. First, you'd need to find something really cold (such as a block of ice), place the thermometer on it, and scratch the glass to mark the mercury level. Then you could do the same thing with something hot (boiling water) and mark the mercury level again. We call these two reference levels of temperature the fixed points. To make a thermometer scale, all we have to do is divide the distance between the two fixed points into lots of sections of equal length. That's how a centigrade thermometer gets its name: it has 100 ("cent") sections ("grades") between the fixed points of ice and steam. What are the different temperature scales and how are they worked out? Originally 32°F (ice melting in salt) and 96°F (Daniel Fahrenheit's definition of body temperature). 0°C (freezing point of water) and 100°C (boiling point of water). Defined according to the triple point of water (where its solid, liquid, and vapor are in equilibrium), which is 273.16 K.
Uses a wide variety of different points at different parts of its range. See ITS-90 for more details. How do Celsius and Fahrenheit compare? You probably know how to convert a Celsius temperature to Fahrenheit: multiply by 9/5 (or 1.8) and then add 32. To convert Fahrenheit to Celsius, you do the reverse: subtract 32 and multiply by 5/9 (or divide by 1.8, which is the same thing). When you hear weather forecasts give Celsius temperatures and their Fahrenheit equivalents, you might feel the relationship between them is a little bit odd and confusing, because they seem so different. But if you plot them on a chart (as I have below), you can see that both scales are perfectly linear, and every rise of temperature that adds another 10°C adds 18°F. 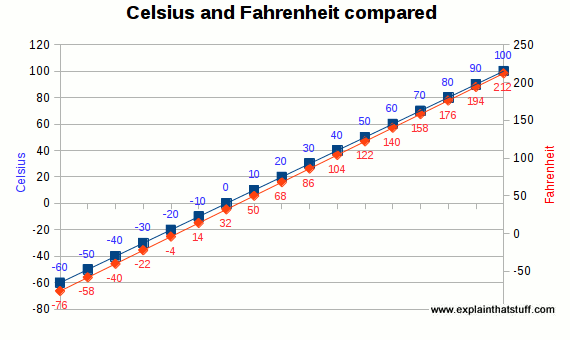 Chart: The Celsius temperature scale is shown in blue with the Fahrenheit scale in red alongside. Each point on the chart shows the two equivalent measurements for a certain temperature, so, for example, 20°C is equal to 68°F. Both scales are clearly linear: an increase of 10°C is the same as an increase of 18°F. Introduction to temperature: All about temperature and how we measure it from the UK's National Physical Laboratory. NIST: Units of temperature: Describes different temperature scales and how to convert them. How do we measure temperature? by Chris Woodford. Gareth Stevens, 2013/Blackbirch, 2005. One of my own books for young readers (ages 7–9). The emphasis here is on temperature as a kind of practical, everyday form of math. Fahrenheit, Celsius, and Their Temperature Scales by Yoming S. Lin. PowerKIDS Press/Rosen, 2012. A historical introduction that runs the stories of Daniel Fahrenheit and Anders Celsius alongside the practical measurement of temperature. Measure It! Temperature by Casey Rand. Raintree, 2010. A basic introduction for ages 7–9, including some coverage of related topics such as weather and climate change. Temperature: Heating Up and Cooling Down by Darlene R. Stille. Picture Window Books, 2004. An alternative, 24-page introduction for slightly younger readers. Thermometers by Adele Richardson. Capstone, 2004. A 32-page introduction covering much the same ground as this article but for younger readers (ages 6–8 or so). Temperature Measurement by L. Michalski. Wiley, 2001. A detailed guide to precise temperature measurements for scientists and engineers. Principles and Methods of Temperature Measurement by Thomas Donald McGee. Wiley-IEEE, 1988. A detailed (nearly 600-page) textbook covering temperature scales and all the different kinds of temperature sensors, including pyrometers, thermistors, and thermocouples.